The 26th of December 2016 a peak of high pollution was registered in the monitoring system of the municipality of Madrid. That peak triggered the activation of the pollution protocol in which a number of measures were put in place in order to reduce contamination. In particular, the protocol included transit restrictions and parking prohibition in most of the city centre. 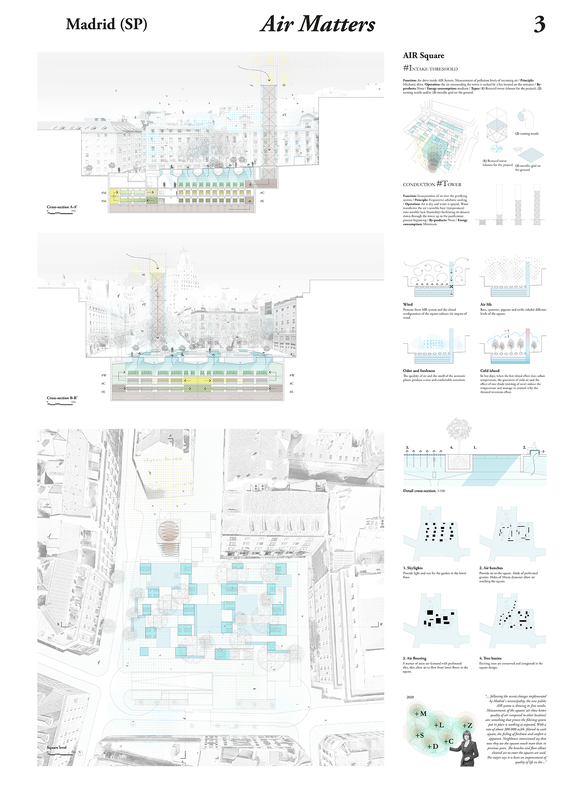 Taking that (not-so) exceptional event as our point of departure, this project claims that air should be taken into consideration, and be included in the ways in which the city is built. In doing so, air should be considered an agent rather than a product and a receptor of such building processes. 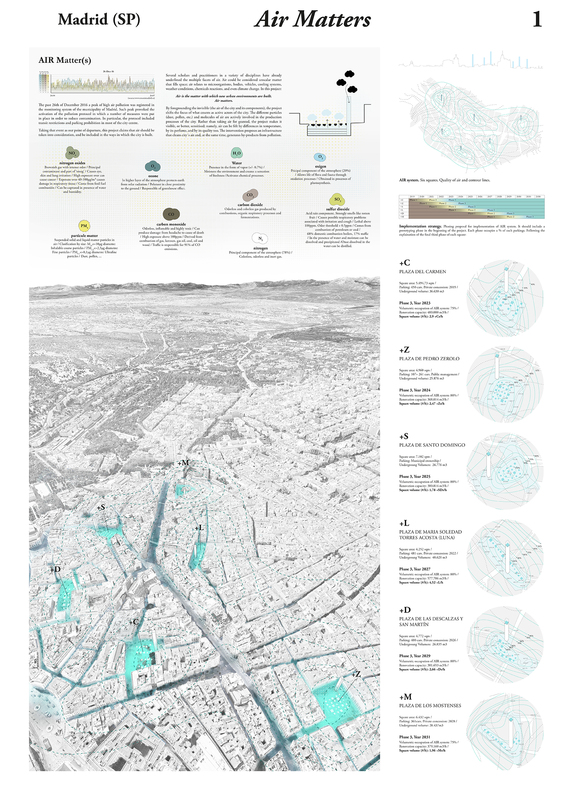 The intervention proposes an infrastructure that purifies Madrid´s air and, in doing so, it also metabolises by-products from pollution. Our project is a productive infrastructure (called AIR [Air Infrastructure for Renovation] System) that builds environments for air, with air and through air. Indeed, it is the particles of air that interact with the system. The infrastructure consists in a series of air filtering prototypes—movable and car-like sized—that could be introduced in the former polluted environment of parking spaces. By activating these parking spaces previously occupied by cars, they are transformed into air productive spaces. The polluted air is sucked, cleaned, moisturised, refreshed and aromatised before it is given back to the squares of the city. In order to implement the infrastructure and help air getting in and out it, the public space has to go through several transformations. 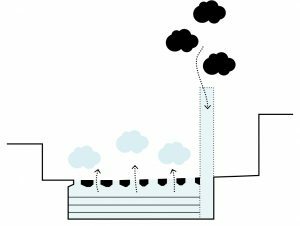 Pavements and urban furniture are specifically designed to favour the processes of air in-take and discharge, and also to provide the infrastructure with basic functioning features—i.e. direct sunlight for the first level which includes a garden. The intervention at square level also works with predicted air movement and behaviour at a micro-local scale and takes into account the reduction of heat island effect. Last 1st of December results were released. 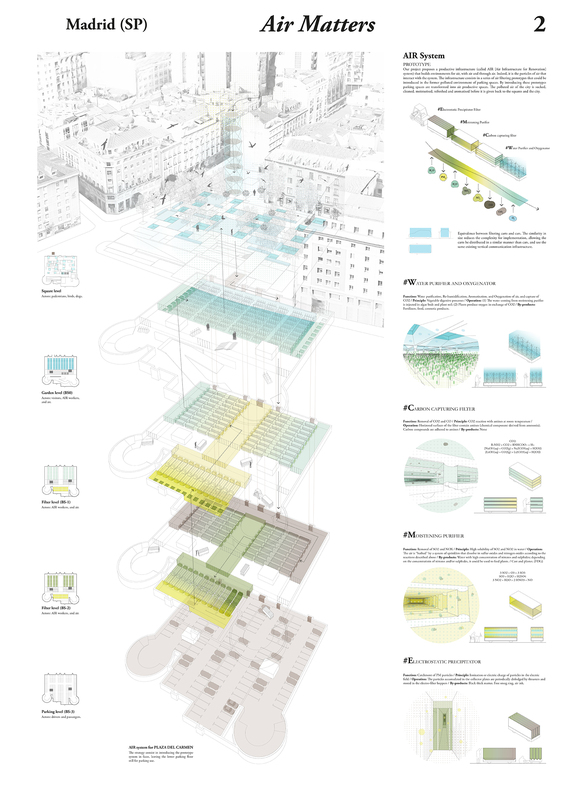 “The jury decided to designate no winner, not because of the lack of quality in the proposals but in order to create the possibility of having a new round of thinking and designing for all of the four selected teams, but this time in full dialogue with the City officials involved in the renewal programme of the six squares”. So, it seems this is just the beginning!! !